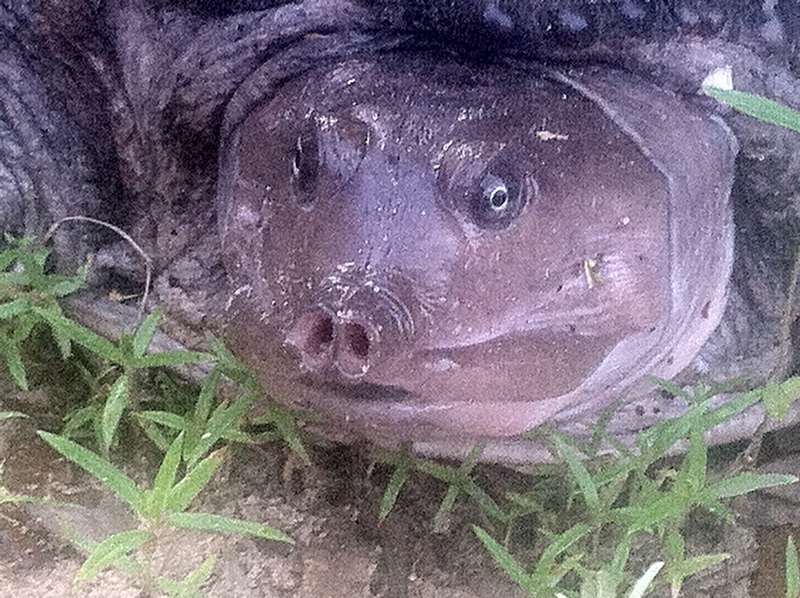 I don’t know Calipash from Calipee, but we ran into this soft-shelled turtle up on the banks of Lake Lafayette on Sunday morning. It was three feet across at the shoulders, and she croaked out a tune that sounded like Wayfaring Stranger, but I can’t be certain of that. The air was so wet the poor girl probably thought we were in her lake and not she on the land. We visited with her long enough for one fellow to pull the plug of white pine out of his seat tube and whittle it down some more, having broken his seat bolt within minutes of starting the ride. Now, for myself, a broken seat bolt is a God-given first-class ticket to the couch on a steamy North Florida morning. Such a catastrophic mechanical is a guilt-free reason to bump down the A.C. and watch Elle Woods win over the curmudgeonly brunette and triumph in spite of, and with the aid of, gender stereotyping. A broken seat bolt? Why it might take until October to fix such a thing! Instead, we were treated to a first-class trail save the likes of which I have never seen. I have packed ripped tires full of pine needles, trued wheels with force against trees, converted more bikes to single speed than are worth counting, and wrapped more dollar bills under sidewall tears than George Washington, but I had never seen this particular solution of plugging the seat tube to hold up a seat post. it’s getting a little techie in here, and I apologize to my friends who prefer to knit potholders, or devise a cooling system for a 1965 Shasta trailer, but I am talking about American Ingenuity damn it all. It saved us from the Nazis, and it brought us the 37 flavor serve yourself yogurt bar so you would do well to endure the minutiae and appreciate a man who carries a pocket knife and knows how to use it. So by the time Joey had risked losing a finger to this old girl, JB was back in the saddle and ready to roll. 1992 steel frame, rigid fork, and cantilever brakes surrounded by full suspension, carbon fiber, and 29 ” tubeless tires. Only a bad carpenter blames his tools. If you want it, find a way. That title might be a bit hyperbolic, but I ran into Ms. Moon, of www.blessourhearts.blogspot.com Friday night. Look at us out on the town. Not bad for a woman who prefers the company of chickens and a misanthropic cyclist. She was there with a whole mess of family, to watch her friends play some music. I was there to apply for a dish-washing job. I’m afraid I tanked the interview, but I aced the swimsuit competition.